Upon entering the Main Sanctuary, visitors will be immediately captivated by the awe-inspiring stained glass windows bedecking the walls of synagogue. Each resplendent window tells a story. Together they symbolize the past and future of the Jewish Nation. 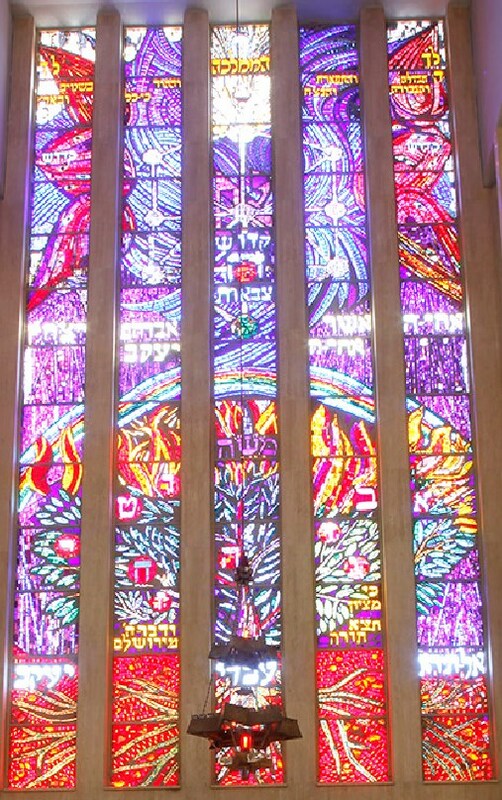 The magnificently unique stained glass windows situated above the Aron Kodesh (Holy Ark), are the work of the late Régine Heim of Zurich, Switzerland. Their colors can vividly be seen during the day, as they are brightened by natural sunlight. They are replete with symbolism depicting the past and the future of the Jewish Nation. As these windows are situated above the Torah scrolls, also referred to as The Five Books of Moses, if one looks horizontally, there are five windows. The central theme is the spiritual and physical worlds which God created. These worlds are divided by the colorful rainbow going across the center. At the very top of the windows is the verse "Yours, O Lord, are the greatness, and the power, and the glory, and the victory and the majesty; for all that is in the Heavens and the Earth is Yours; Yours is the Kingdom (I Chron. 29.11). During daylight hours, it is difficult to gaze upon the top of the center window, just as Moses covered his eyes at the burning bush. The dominant color of the upper part of the windows is blue, the color of one of the fringes on four cornered garments (Numbers 15.39), and representative of the spiritual world On either side of the upper part are three wings, symbolizing the Divine throne depicted by Isaiah (Chapter 6). In the middle wing on each side is the word "kadosh" (Holy) and the completion of the phrase in that chapter of Isaiah is in the middle window. The diagram of the 10 sefirot (emanations) is likewise found in this spiritual portion. Below the rainbow, we are introduced to the physical, material existence. The symbol for that world is fire. Fire can be used to create, but it can also be employed to destroy. Immediately below the rainbow, we see the fire used to create energy and assist in the building of a better world. That is the burning bush (Exodus Chapter 3) seen by Moses as he is confronted by the Almighty. It is the symbol of our People, which will never be consumed despite the trials and tribulations which we face. What makes this fire constructive, is the fact that it is built on a system of Laws and Ethics which are depicted (from right to left) by the Hebrew letters "Aleph" through "Yud" (the first ten letters of the Hebrew alphabet) symbolizing the Decalogue (commonly, but mistakenly, referred to as The Ten Commandments). At the lower extremity of the windows is the fire of destruction – the attempt to destroy the Jewish People, which we have experienced in every generation. But, from out of that fire of destruction, we see the roots of the tree. The tree represents the human being (Deuteronomy 20.19) and it also represents the eternity of the Torah (Proverbs 3.18). From amidst the fire of all of the evil perpetrated against our people throughout the ages, God tells us: "Be not afraid, my servant Jacob (Isaiah 44.2); for from out of Zion will come Torah, and the Word of the Lord from Jerusalem (Isaiah 2.3)." These windows are the symbols of the very meaning behind the building of The Jerusalem Great Synagogue. Dedicated to honor the everlasting memories of those Six Million of our brethren who were murdered in the Holocaust and those who sacrificed their lives for the re-establishment and defense of The State of Israel, we gather in a spiritual center where Torah, worship and acts of kindness and caring for others are paramount. The Jewish people will live, Torah is eternal and, we have returned to our home - the Land of Israel.